The world of Warhammer 40,000 has always been one of my favorites in the sprawling landscape that is the back alley parking lot of genre universes. Bleak and compelling, Games Workshop has built up this world over the course of several decades of miniatures, roleplaying games, card games, computer games, and fiction. And in the past 5 years, they’ve basically handed the license over to just about everyone who asked. This led to some ups (Space Marine, Space Wolf) and some downs (Storm of Vengeance, Space Hulk). The Horus Heresy: Drop Assault lies somewhere in between. In gameplay, this strategy/battle game is pretty much identical to Star Wars: Commander, Battle Islands, and every other free-to-play mobile game out there. It doesn’t bring anything new to the table beyond the Warhammer 40k universe. You build a base. You raise an army. Want to upgrade that base? Click here and come back in 4 hours. You know the sort I’m talking about. It’s fine for what it is, and if you get frustrated enough, you might toss the publisher a few shekels to make your units repair faster. There’s a base-building game out there for Star Wars fans, there’s a base-building game out there for Jurassic Park fans, and now there’s a base-building game out there for Warhammer 40k fans. That’s really all that needs to be said about Drop Assault on the surface. Having said all of that, being that I am a Warhammer 40k fan, there were a few things I thought were worth addressing. First off, an important detail to note is that this is the first game ever set in the Horus Heresy era of the 40k universe. For those of you playing the home game, the main plot of Warhammer 40k centers around the Imperium of Man, which was founded in the 30th century by the Emperor–a nameless Santa-Christ figure who travelled the stars, bringing peace and logic to the many planets of humanity. He surrounded himself with his genetically enchanced “sons”, the Primarchs, each of whom led their own personal army of superhuman Space Marines. And just like anyone with a shot of tequila and a handful of religious texts could have guessed, one of these Primarchs (Horus) betrayed the Emperor and split the greatest army of humanity into two factions: the Loyalists and the Traitors. This early era of war and betrayal is called The Horus Heresy, and is set over ten millennia before the standard timeline of Warhammer 40k. Because it’s not just 40k–it’s a specific time period within 40k. It’s a niche within a niche. If the developers wanted to maximize players and cashflow, they could have just gone with the standard era: there’s a hell of a lot less history to learn in order to make that relevant. But they went with a time period that requires history. And while the opening cinematic doesn’t exactly dig deep into the bottomless trench that is the Games Workshop story banks, it’s more than they would have needed if they’d chosen a simpler setting. So I have to give Complex Games credit: they’ve created a game that is for the fans of the Warhammer 40,00 universe, and that impresses me. Having said that, there were some odd choices made. Drop Assault takes place on the world of Isstvan III during the betrayal that would be the inciting incident of the Heresy itself. It’s a huge moment in 40k’s history, and the choice of fighting with the Traitors or the Loyalists is a tough decision to make. Both are so full of character and unique qualities that my final decision to team up with the Emperor and his loyalists didn’t come easy. So imagine my surprise when it came time to choose from one of four Marine Chapters, and the only choices were Traitor legions. No Raven Guard, no Ultramarines: my beloved Salamanders nowhere in sight. At first I thought it was a mistake. But the descriptions make it clear: your choice is, essentially, to play as a Traitor or a Traitor to the Traitors. When I consider the fact that civil war among those who were causing civil war isn’t really a massive part of the Horus Heresy storyline, I couldn’t help but find this lack of variety… well… stupid. More than that, it feels lazy. We’re not talking about the addition of Eldar or Hufflepuffs or some damn thing: we’re literally talking about four different coats of paint. It was an omission that stuck in my craw. I mean, if you’re going to offer the fans a unique setting like this one, why screw with their toys? Pictured: Heresy-era Emperor’s Children fighting Heresy-era Death Guard… whatever. The music is good, and works with this setting: your standard, T-2 inspired “glory-or-death” sort of orchestration. 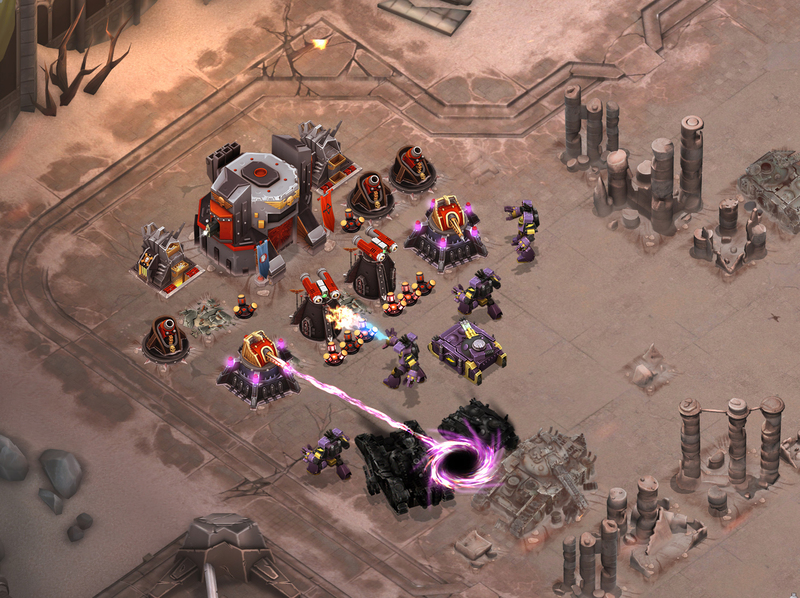 The visuals are decent, even if your units do have a low framerate, Saturday morning cartoon feel to them. Heresy-specific troops (Cataphractii Terminators, etc.) are handsomely represented. There’s also very little emphasis on the microtransaction aspect to this free-to-play game, which is admirable as hell. I also like the idea of slowly uncovering a planet, region by region: it fits the narrative, and will bring you back to collect more resources over the course of, say, a month or two. Perhaps more if you truly love the Horus Heresy, which I do. With the upcoming release dates of Blood Bowl 2, Eisenhorn: Xenos, and the MMO Eternal Crusade swiftly approaching, it’s clear that we’re going to have a big year of Games Workshop releases, and I will do my best to cover as many as possible. And while I would have preferred something with a little more innovation to start my new year of God-Emperor related gaming, I can’t pretend that Drop Assault doesn’t deliver on a few months worth of free nerdy goodness to load into my Bolter. 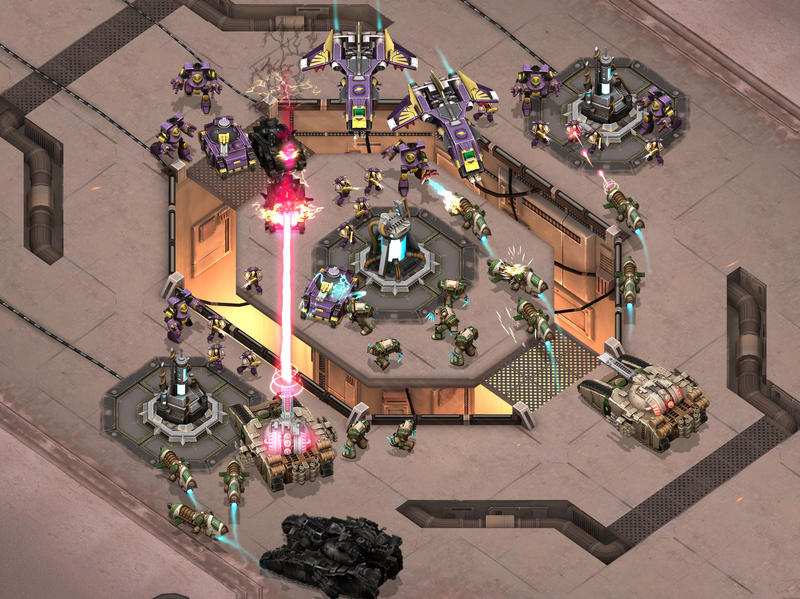 The Horus Heresy: Drop Assault was developed by Complex Games and is available for all iOS devices. More GW News: Battlefleet Gothic Coming Soon To Exterminatus Your PC! The Games Workshop Steamroller Marches On! ← All the fun of Vietnam is coming to your Ipad, kids! Well, one of the points you had mentioned was the lack of variety being there were only 4 legions available. All of which are traitor legions. Keep in mind that the game takes place on Isstvan III. There were no other loyal legions present during the betrayal. In my opinion, it would have been better to make the game based around Isstvan V where you would have more variety in the different legions available. But of course that would take tremendous effort to put in 7 traitor legions and 3 loyal legions.